Tug1 OE in podocytes protects against features of DN. (A) Scatter plot of RNA-seq values for individual transcripts classified as noncoding RNAs. (B) Nephroseq expression data for TUG1 in control subjects (n = 13) and in subjects with DN (n =9). (C) Linear regression analysis of the same subjects in B, with eGFR values. (D) In vivo time course analysis of Tug1 expression in podocytes from diabetic and nondiabetic mice (n = 6 mice/group). (E) Schematic of Tug1Tg construct. Tug1 cDNA was cloned upstream of WPRE and hGH polyadenylation sequences. Expression is driven by the human NPHS2 (podocin) promoter. These elements are flanked by HS4 insulator sequences. Illustration shows the mating strategy to generate podocyte-specific diabetic Tug1PodTg mice. Representative image of adult control diabetic (db/db) and diabetic Tug1PodTg mice. (F) qPCR analysis of RNA isolated from podocytes measuring Tug1 levels in 24-week-old db/m (n = 5), db/db (n =5), db/m Tug1PodTg (n = 7), and db/db Tug1PodTg (n = 7) mice. 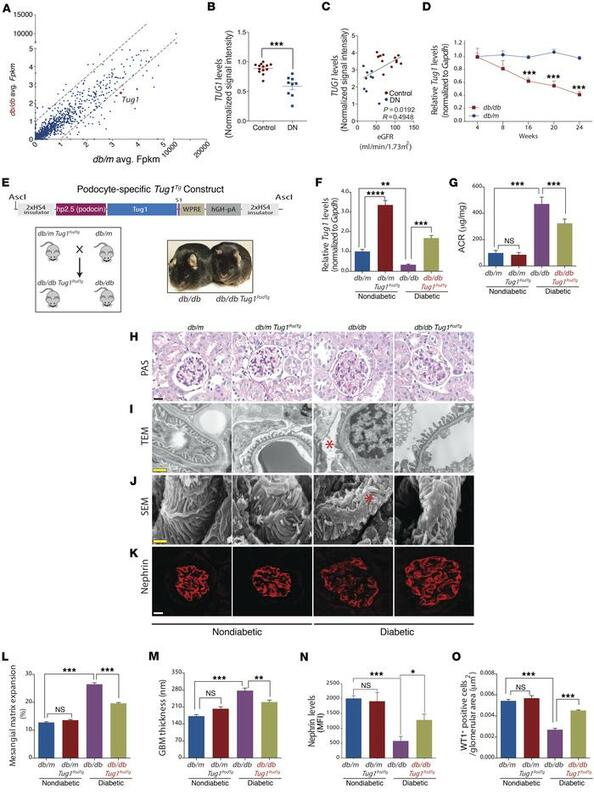 (G) ACR analysis demonstrating a significant reduction in albuminuria in 24-week-old diabetic Tug1PodTg mice compared with that in controls, as in F. (H–K) Representative (H) PAS-stained image; (I) TEM micrographs; (J) SEM micrographs; and (K) nephrin immunofluorescence confocal micrographs. Red asterisks on the TEM and SEM micrographs denote effaced podocyte foot processes. Scale bars: 50 μM (H and K), 0.5 μM (I), and 1 μM (J). (L) Quantification of mesangial matrix expansion determined as the percentage of PAS-positive area/glomerular area. (M) Quantification of GBM thickness. (N) Quantification of nephrin mean fluorescence intensity (MFI)/glomerular area. (O) Quantification of WT1-positive cells/glomerular area. *P < 0.05, **P < 0.01, ***P < 0.001, and ****P < 0.0001, by 2-tailed Student’s t test (B), linear regression analysis (C), and 1-way ANOVA, followed by Tukey’s post-hoc analysis (L–O). Data represent the mean ± SEM.